"Built in 1836 and originally a part of the Christ Church complex, the Kasmanda Palace today is one of the best heritage hotels in Mussoorie. A wonderful example of Anglo-French style of architecture, this white color mansion has been a sanatorium, a school and then a summer palace. 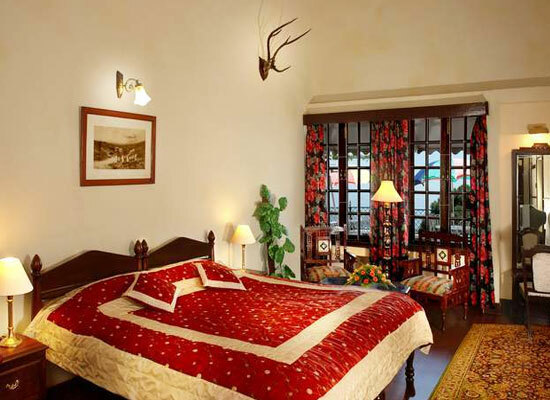 Positioned 200 m uphill from the Mall road, this heritage hotel is spread in 3acres of pine forest and lush lawns. The hotel has 24 exquisitely-designed guest rooms, filled with world-class comforts and boasting of an old-world charm. 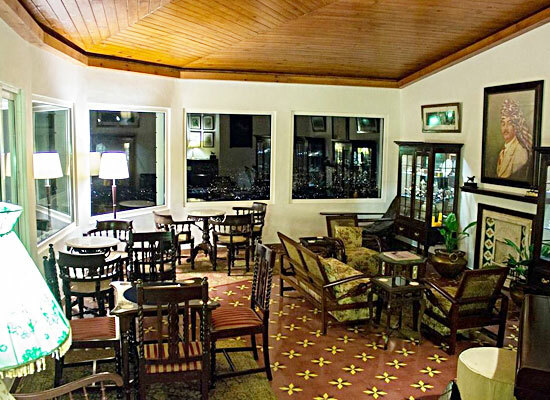 There are two dining venues where the guests can savor Indian and famous World fares, along with finest of beverages. One of the oldest buildings in Mussoorie, Kasmanda Palace was commissioned by Captain Rennie Tailour of the Bengal Engineers, way back in the year 1836. Formerly, it was a part of the Christ Church complex. Later, it became a sanatorium for the British Army. Then, it was turned into a school and became one of the first schools in Mussoorie. Afterwards, in 1915, the mansion became the summer retreat of the royal family of Kasmanda. It was 1992 that the main building of the property was converted into a heritage boutique hotel by Rajkumar Dinraj Pratap Singhji and Kunwarani Saheba Yadu Nandini Singh of Kasmanda. It was then named Kasmanda Palace. Even today Rajkumar Dinraj Pratap Singhji comes and stays at the Palace Hotel along with his sons and grandsons. The property has been with the Kasmanda family for six generations. 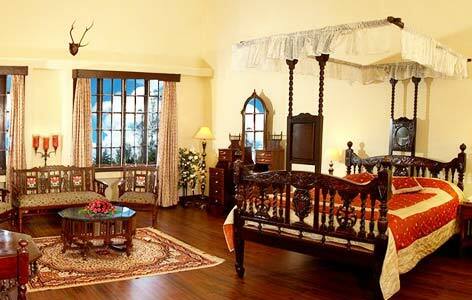 Kasmanda Palace has 24 spacious and sophisticated double bedrooms that offer a comfortable stay to the guests. The guestrooms here are a wonderful amalgam of modern facilities, impeccable hospitality services, and a traditional décor. As this is a heritage hotel, no room is identical in décor, size and shape, except the Superiors rooms, which are made in the new wing. Deluxe Rooms (7) Deluxe Rooms fall in the base or standard category of rooms and are placed in the Heritage Wing of the property. However, there is no Garden or Doon Valley view. Superior Rooms (10) Superior Rooms are further segregated into two categories- the Heritage Wing Rooms offer the view of the Doon Valley and the Modern Wing Rooms offer the views of the hotel’s Garden Area. Royal Rooms (7) The largest rooms in the palace property, the Royal Rooms are placed in the Heritage Wing. They either face the Doon Valley or the Garden area of the hotel. Offering the view of the garden and the Magnolia tree, the Magnolia restaurant serves magical views with sumptuous meals. Here the guests can savor lip-smacking delicacies of Indian, tandoor, and Chinese cuisines. Some dishes of Continental and Regional cuisines are also served. On special request by the guests, the chef can also prepare some dishes of Rajasthani cuisine. 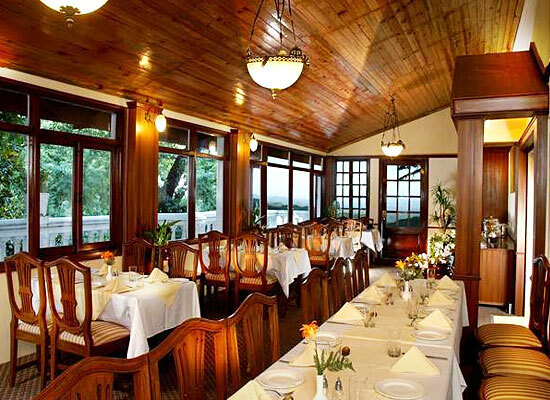 At the in-house restaurant, Continental, Indian, Chinese and Regional cuisines are served, amid a wonderful ambiance.